Ākāśagarbha Bodhisattva (Sanskrit: Chinese: 虛空藏菩薩; pinyin: Xūkōngzàng Púsà; Japanese pronunciation: Kokūzō Bosatsu; Korean: 허공장보살; romaja: Heogongjang Bosal, Standard Tibetan Namkha'i Nyingpo, Tibetan: ནམ་མཁའི་སྙིང་པོ། ) is a bodhisattva who is associated with the great element (mahābhūta) of space (ākāśa). Ākāśagarbha is regarded as one of the eight great bodhisattvas. His name can be translated as "boundless space treasury" or "void store" as his wisdom is said to be boundless as space itself. He is sometimes known as the twin brother of the "earth store" bodhisattva Kṣitigarbha, and is even briefly mentioned in the Kṣitigarbha Bodhisattva Pūrvapraṇidhāna Sūtra. Kūkai, the founder of Shingon Buddhism, met a famous monk who is said to have repeatedly chanted a mantra of Ākāśagarbha as a young Buddhist acolyte. Kūkai took a tutorial with him on Kokuzou-Gumonji (a secret doctorine method, 虚空蔵求聞持法). As he chanted the mantra, he experienced a vision whereby Ākāśagarbha told him to go to Tang China to seek understanding of the Mahāvairocana Abhisaṃbodhi Sūtra. Later he would go to China to learn Tangmi from Huiguo, and then go on to found the Shingon sect of esoteric buddhism in Heian Japan. Additionally, he appears briefly in the final chapter of the Kṣitigarbha Bodhisattva Pūrvapraṇidhāna Sūtra, requesting the Buddha preach on the benefits of praising that sutra and of Kṣitigarbha. Akasagarbha at Buddha Tooth Relic Temple and Museum, Singapore. The mantra of Ākāśagarbha is popularly used by Shingon Buddhists, practitioners of Tangmi, and by artists. It is believed to give rise to wisdom and creativity, and dispel ignorance. ↑ Abe 2013, p. 74. ↑ Śikṣānanda 2003, pp. 89-93. Abe, Ryūichi (13 August 2013). The Weaving of Mantra: Kūkai and the Construction of Esoteric Buddhist Discourse. Columbia University Press. ISBN 978-0-231-52887-0. French, Frank G.; Shih, Tao-tsi; Śikṣānanda (2003). The Sutra of Bodhisattva Ksitigarbha's Fundamental Vows. Corporate Body of the Buddha Educational Foundation. Thích, Nhất Hạnh (1998). The Heart of the Buddha's Teaching: Transforming Suffering Into Peace, Joy & Liberation : the Four Noble Truths, the Noble Eightfold Path, and Other Basic Buddhist Teachings. Broadway Books. ISBN 978-0-7679-0369-1. Visser, M. W. de (1931). 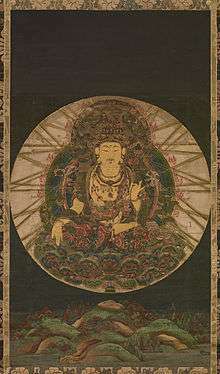 The Bodhisattva Akasagarbha (Kokuzo) in China and Japan, Amsterdam: The Royal Dutch Academy of Sciences. Wikimedia Commons has media related to Akasagarbha.